A CNBC Asia guest and New York hedge-fund manager has been charged with carrying out a $4 million Ponzi scheme and he’s on the run, according to the Daily News.35-year-old Brian Kim has been accused of single-handedly pilfering cash from at least 45 West Coast investors. What’s funny is that he promoted himself on TV — CNBC Asia had him on twice as an Asian futures derivatives trading expert. 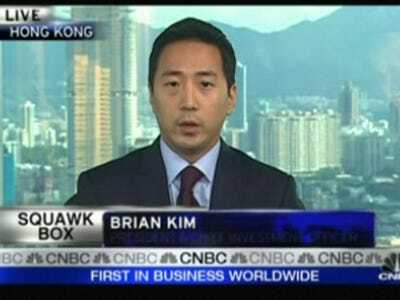 Brian Kim allegedly began phony hedge fund, Liquid Capital, back in 2003. On an Asia “Squawk Box” in August 2009 Kim talks about Korean equities and why as an investment vehicle its so attractive (clip below). Then in November CNBC Asia had him on again to talk Dark Pools, and was even asked about transparency and legality of the somewhat mysterious markets. He targeted tech industry employees in Silicon Valley and Washington according to officials. He’s been a fugitive since January. He was supposed to face trial in Manhattan for a separate crime charge (he’s accused of stealing $438,000 in 2008 from the Christadora House, an East Village condominium where he lived). [Kim] induced his clients to make risky and speculative investments by portraying himself as an accomplished trader and money manager. Kim is said to have produced fake “pitch books,” doctored financial statements and told prospective clients that he’d generated returns of 240% since 2000, the Daily News said. Then, once he had the cash, he poured the funds into several bank accounts to cover investor losses, and continued to tell his clients that his trading in e-mini S&P futures contracts was generating awesome returns. With the allegedly stolen funds Kim took himself of ski trips, gambling adventures in Atlantic City, vacations in Vermont, and shopping sprees at Barneys, and well as using the money for more mundane things like payment of credit-card bills and car payments.